This neighborhood, this place we call home, was once defined by what it wasn’t. It wasn’t “Portland” for the first 150 years that the city of Portland existed. It was Multnomah County; Portland grew around it and absorbed it in 1985. Cully’s history is therefore recorded less in books and ledgers than in the memories of its long time residents. Up to 80 years of our past can be reclaimed by talking to neighbors. 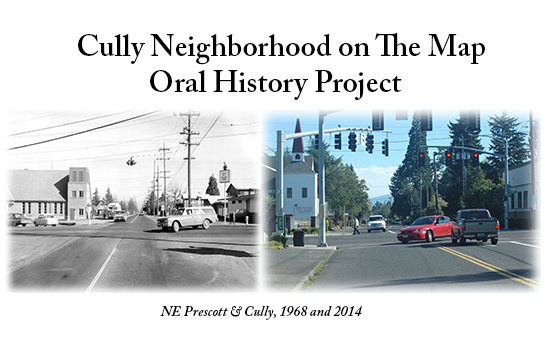 This project, Cully Oral History on the Map, marries the audio of oral interviews with maps and pictures to record the people, places, and events that formed our neighborhood. Visit the links below for more detailed information on each site.